When Kelly from Here Comes the Sun linked up this awesome Kid Wash at our Summer Fun Party, I knew I wanted to make one soon. When the temperatures here hit 95+ degrees last week during a pre-summer heat wave, I decided I needed to make one immediately. Let me tell you, it was SUPER EASY (took me just about a half an hour to do) and the kids LOVE it!! I ended up making mine a sprinkler instead of installing misting jets, but otherwise kept the design the same as Kelly's. 1. Cut your PVC pipe. Take one 10-foot piece and cut it into two 5' lengths. Take the other 10-foot piece and cut it into one 4' length, and four 18" lengths. Not the most flattering picture, but it was 96 degrees out!!! The ratcheting PVC pipe cutter that made this job easy! 2. Drill your sprinkler holes into the 4' section of pipe. My tip for this part: Temporarily slide the t-connectors onto the ends of the pipe. This will keep it steady while you drill the holes! Using the 1/16" drill bit, put holes every couple inches. I spread them out so some holes were in the center and others more towards the sides. The more holes, the wetter you'll get. Use the t-connectors to hold your pipe steady to drill. Me rocking the power tools!! 3. 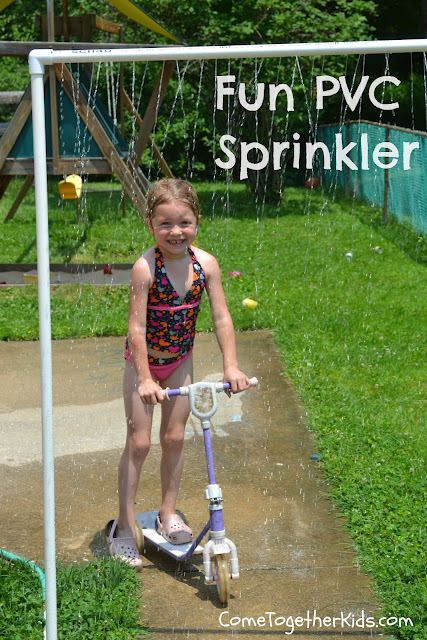 Assemble your sprinkler. Remove the t-connectors that you put on to steady your pipe and replace with the elbow joints. Attach the two 5' pieces to your drilled 4' piece to form a large U. Then put your t-connectors on the bottoms of the 5' pieces and attach the 18" sections to form the base. Add the end caps on three of open ends of the 18" sections. On the fourth open end, put on your hose connector. I didn't get a picture of the last steps of assembly because my 5-year old photographer got sidetracked, but you can hopefully figure it out from the finished product here. 4. Hook up your hose and get the party started!! I found that I got really good sprinkler action with just a little water pressure, so I didn't turn the hose on all the way. Without strong pressure, I found that I didn't need to use the PVC cement and the pipes stayed together just fine without leaking. I'll update if I find I do need to glue it, but in the meantime, I love that I can easily disassemble our sprinkler. It also makes a great "teeth massager" according to my five-year old. AWESOME! I'm going to share this with my daugher for her boys! So fun!!! I was looking at ideas like this last weekend too. I'm sure the kids love it! What a great idea. I'm going have to try this. Wish I had one of these when I was a kid! That looks like fun! So fun! We actually have extra PVC pieces lying around, I'll have to show my hubby and see what we can come up with. Thanks for sharing this fun idea! OMG! Brilliant! Genius! Really need this for my kids and the dog! I wanna make this for my kids!!! I love it. I really like this project! What a great idea!!! OK, Now I want to make one! It has been miserably hot here already. FUN!! My kids would love this esp since it has been so HOT here!! Love it! My husband has talked about making something like this....I think it's a must now that we're about to move to Florida! Thanks for the instructions! Thanks for the idea! I'm gonna give it a shot. Adding a trip to Home Depot to my To-Do list for tomorrow. My kiddos are gonna FLIP!! Love this idea, my husband just made the comment he wanted to poke holes in one of our hoses, but I think this would work better! 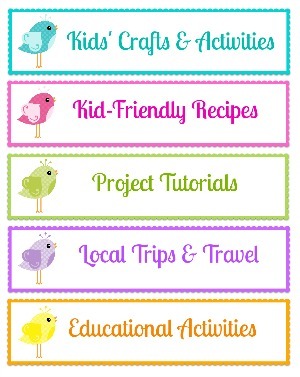 Please stop by www.laughloveandcraft.com and link up to my Share the Wealth Wednesday Link Party! Made this for the kiddos this weekend and it was a HUGE hit. I actually got them to cut my PVC at Lowe's so I didn't have to buy that handy dandy tool but other than that I followed your supply list and it was so easy. My hubs was really impressed. Thanks for sharing. I featured you on my blog today!! Just blogged about this! Thanks for the awesome idea! I made it and it cost me $9.57. My kids love it. Thanks! I just found your blog last week and love it! Yesterday I went to Home Depot and bought all the pieces to make this, and made it today. SUPER easy and its been a big hit! And I made it for just under $10. Yessss! Thanks for the instructions. I shared it on my FB page and linked it with your blog! Thanks again!! Whoa, that is a nice home-made sprinkler! Your kids are having fun at a pretty cheap price! 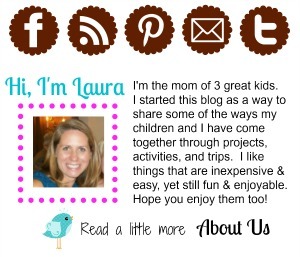 You rock, Laura! We are already in the 70's and I'm thinking we'll be using this in just a few weeks. THANK YOU!!! We did this today and loved it! We just need to go back and get a couple of parts from the store. Thank you for the post. I made one of these today using your plan and it was so easy. It took me no time at all. I'm hoping that it will be warm enough to use it tomorrow. The kids are very excited about it. My son totally wants to make this! What an awesome idea! thanks! Great idea! I'm thinking of using this set up in a wedding in a few weeks to hold some material. Do you think it would be sturdy enough to hold material? Or would it need another bar across the bottom? good this path is such a problem. Introduce SHAREit on both devices. shareit download for pc as well as Vice Versa. If you obtained an android phone best. good the useful information regarding iTube, you will certainly https://itubedownloadappz.com enjoying experience. Firstly, you should certainly download an nice. xHubs application drew in a lot of the individuals https://xhubs.org/ the most recent, old motion pictures as well as television. Down once more each time it obtains compressed. Pandora Music Radio You could reject specific material from playing. Very useful information, please share more information like this. really looking forward to this.